You are here: Home / Uncategorized / Emergency Response: What’s In A Name Tag? Emergency Response: What’s In A Name Tag? I’m going to be honest, I used to think name tags were only a customer service necessity and having all of my lifeguards and staff wearing name tags made them look professional. I also remember embarking on a “wearing name tag” battle with my new staff after taking over an operation. It was the second change I implemented after the “tuck in your shirt” challenge. These small changes were a slow process towards larger and more substantial operational changes, and at the time I almost viewed them as insignificant. More or less, just getting buy-in and getting staff to be comfortable with change. I recently changed my view on name tags after reading an article (link at bottom) about a new trend in operating rooms started by a guy named Dr. Rob Hackett. He had his name “Rob” and position “Anaesthetist” printed boldly on his cap he wore into emergency surgeries. Rob received some flack at first but pointed out that this was a simple solution to improve patient care and outcomes. By having their names on their surgical caps, medical staff can save valuable time and avoid mistakes, communication delays, and errors. Dr. Rob gives several examples of how mistakes were made because names and qualifications were not overtly known. These examples made me think of emergency responses in several of my past operations. I could remember an emergency situation where at the beginning of the season we were setting up oxygen and I turned to ask a lifeguard to get the oxygen key out and turn on the tank. When I turned, there were two new lifeguards talking to each other waiting to help….both of which I didn’t know their names. I ended up tugging on one of the lifeguard’s shorts to get their attention and followed up with my oxygen instructions. I remember another time when during an emergency I looked up and pointed at a lifeguard and told her to go call 911 and the guard standing behind her went to the phone. And the time I called a lifeguard David and he pointed at himself clarifying I was talking to him because his name was really Brian. Or the time I asked during care what the patient’s vital signs were and had a choir of response which I then had to have one specific person repeat. I could recall more, but the point that kept coming up in my head was the lack of directness or specific instruction because at times I personally did not use names. 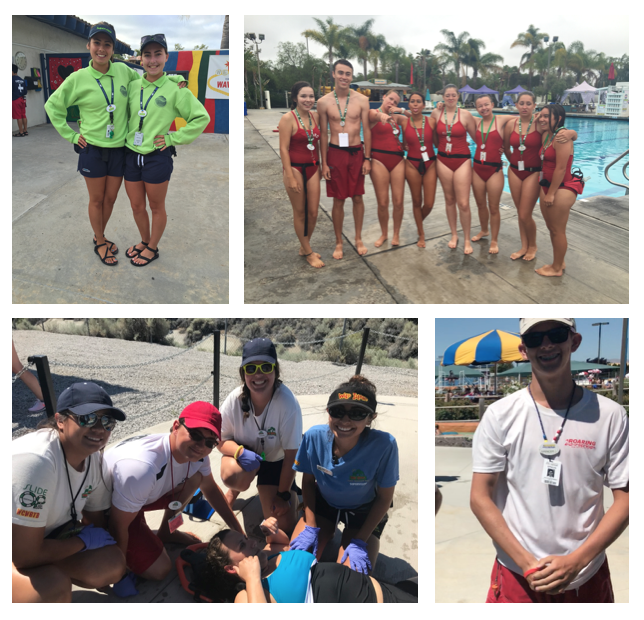 Now, I tried to learn everyone’s names…it was one of my goals within the first few weeks, but when you have a staff in the hundreds, or new employees rotating in, twins working on your team, or lifeguards who just looked alike in their uniforms, there always seemed to be someone who I wasn’t 100% sure of their name. Then I started to also think about EMT’s responding to lifeguards providing care and not knowing the lifeguard names, and the lifeguards may not know the EMT’s names or the Supervisors names, or heck even my name. I wondered if EMS being integrated into a scenario was sometimes confusing with new faces. At all levels, if names were clearly known, communication would be so much more direct and clear, maybe even hesitation would be reduced because we wouldn’t have to think about names, just about what needed to be done. My lightbulb moment, name tags are more than a customer service tool or professional lanyard decor…they are a part of our emergency response being effective and timely. And yet I so easily dismissed their importance. Name tags shouldn’t be removed and set to the side during in-service training, and we should probably even start practicing utilizing names during our EAP scenarios. I would love to see names on shirts or hats or wherever it can be large and legible, but at a minimum, that name tags are presented front and center with large clear lettering and that staff understands the importance of the name tags. During events our thoughts should be spent on communicating clearly, providing patient care, and managing the scene appropriately. As Dr. Rob said, mistakes and time in the operating room can have huge consequences. I think the same may be argued about timely lifeguard response.